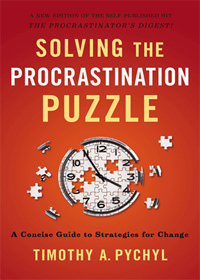 On March 28, 2014, we had a Q&A Interview with Timothy A. Pychyl, PhD, international authority on procrastination, Associate Professor of Psychology and Director of the Centre for Initiatives in Education at Carleton University in Ottawa, Ontario, Canada and author, Solving the Procrastination Puzzle. As a researcher, writer, and speaker about procrastination for almost 20 years, Tim has garnered an international reputation for his scholarship and a global audience for his iProcrastinate Podcasts and his Don’t Delay Blog with Psychology Today. His 2010 book, The Procrastinator’s Digest: A Concise Guide to Solving the Procrastination Puzzle was a highly-rated, concise, and procrastinator-friendly guide to working with patterns of procrastination that was expanded and recently republished as Solving the Procrastination Puzzle: A Concise Guide to Strategies for Change. What makes us sabotage our own best intentions? How can we eliminate procrastination from our lives for good? Recent research differentiates between procrastinator vs. non-procrastinator personality characteristics (impulsivity, conscientiousness, and perfectionism) and prefrontal cortex functioning, as well as factors like task aversion and meaningfulness during critical phases of goal achievement: initiating, planning, and actually taking productive action. The latest research points to the importance of emotional intelligence, including both awareness and stability, and self-control strengthening for overcoming procrastination to create new habits. Repairing moods such as anxiety or worry in productive ways can also help intercept continued procrastination. And “time travel,” or imagining the future self and benefits after a task is completed or not tackled can shift our perspective to make action more likely. Based on current psychological research and supplemented with clear strategies for change, this guide was designed to help readers finally break free from self-destructive ideas and habits, and move into freedom and accomplishment. With numerous practical tips for change, Solving the Procrastination Puzzle brings clarity and scientific studies-and a touch of humor-to the quest for successfully achieving goals. This accessible guide is useful for entrepreneurs, parents, graduate students, and anyone who wants to get unstuck, stop delaying, and start living their most inspired life. The integration of new research and practical strategies should be especially useful reading for both new and seasoned coaches. 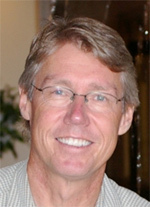 Dr. Timothy A. Pychyl is Associate Professor of Psychology at Carleton University in Ottawa, Ontario (Canada), with a cross-appointment to the School of Linguistics and Language Studies. In addition, he is the Director of the Centre for Initiatives in Education at Carleton University. A passionate educator, Tim is a 3M National Teaching Fellow who has received numerous other teaching awards including the Ontario Confederation of Faculty Associations Teaching Award, the University Medal for Distinguished Teaching and most recently the Graduate Faculty Mentor Award. Tim teaches a doctoral-seminar on university teaching in the department and supervises the doctoral-student-mentored teaching program. He has been a pioneer in introducing technology into education. He is an invited speaker across the country presenting research on procrastination and training teachers in strategies that help procrastinators move forward. Tim’s research is focused on the breakdown in volitional action that we commonly call procrastination-the gap between intention and action towards successful goal completion. Over the past 19 years, Tim and his students have conducted research to better understand how we become our own worst enemies with needless delay. This self-regulation failure has come to be understood as an avoidant coping strategy that provides short-term mood repair to the present self at the expense of future self. Tim’s current research is exploring the strange dichotomy between our present and future selves and how we can bridge this gap to reduce self-defeating delay and failure in goal achievement. So, what inspired Tim to investigate the roots of procrastination? How has becoming an expert on procrastination changed his own approach to meeting goals? He readily admits that as an undergraduate, putting off assignments was “the bane of (his) existence.” He skipped classes, lacked direction, and left college after three years. In a struggle to find out where he really “belonged,” he sampled life at an Anglican seminary at Ontario’s Huron College, a Roman Catholic monastery in New York, and then tried stints as a tennis instructor, a teacher of wilderness survival skills, and finally, a manager of an Ottawa outdoor outfitting business. He returned to the university to study linguistics, education and psychology and wound up with five degrees, including a PhD from Carleton, where he became a professor specializing in procrastination. Over the years, he seems to have licked the temptation to put things off until later (avoiding self talk like “I will feel more like doing it tomorrow.”) by solidifying a more productive habit: (“Just get started on it.”) He has become aware of the flags that tell him he’s rationalizing his current behavior–which is not doing anything–and simply making excuses. “People become their own worst enemies-the only person standing in their way,” Tim says. When not on the Carleton University campus, Tim can be found at home on his hobby farm with his wife Beth and two children, 8 year old Laurel and 6 year old Alex. At 58 years of age, Tim thinks of himself as a happy “dinosaur dad.” In addition, he cares for and runs a team of eight sled dogs, is known as a dog “musher” and keeps horses on his farm for pleasure riding. It’s a rich, busy life that provides a restorative environment and balance for him and his family. And in responding to the constant needs of growing kids, Siberian Huskies, and farm animals, he constantly reinforces the habit of “just doing it now,” rather than putting it off. iProcrastinate, Tim’s iTunes podcast, typically in the top 15 podcasts in the self-help section. Why don’t we just do it? How research is helping to solve the procrastination puzzle. Tim’s detailed PowerPoints for a procrastination presentation. “How to Be a Productive Procrastinator”, transcript of an NPR interview on Talk of the Nation. Procrastination and Self-Regulatory Failure. Journal of Rational-Emotive and Cognitive Behavior Therapy special issue on procrastination. Tim was co-editor. Sirois, F. & Pychyl, T.A. (2013). Procrastination and the priority of short-term mood regulation: Consequences for future self. Social and Personality Psychology Compass, 7, 115-127. To Stop Procrastinating, Look to Science of Mood Repair: New Approach Focuses on Helping People Regulate Their Emotions . Wall Street Journal, 1/7/14. Sloth: To Stop Procrastinating, Focus on Emotions. Scientific American. November, 2013 issue. Why Wait? The Science Behind Procrastination. Association for Psychological Science Observer. April 4, 2013. Excellent summary of procrastination research. Treat your future self better – stop procrastinating now, The Globe and Mail. 12/10/12. Pychyl, Timothy A. (1/3/14). Procrastination Back Story: Less Agent, More Agency . Tim describes his approach and journey toward publishing on procrastination. Counseling the Procrastinator in Academic Settings, Tim co-edited this book in 2004. Addresses the estimated 70% of students who exhibit procrastination in academic environments. Mullan, Bryan. (2008). Mr. Mom. Carleton University’s Magazine. Feature article on Tim as “Mr. Mom” or (in his terms) “Dinosaur Dad”. A day with a busy man who’s an expert on getting things done . The Ottawa Citizen, 1/14/08. Mr. Procrastination. Mushing Magazine. Tim’s passion about being a dog musher.